I buy this as part of my overall anti-aging health regiment. It is an extremely powerful antioxidant, and also helps with receding hair. The taste is pretty decent, I just put a serving in my mouth and wash it down with my morning protein shake. I highly recommend this product to anyone who takes their overall wellness seriously. Great company with high quality ingredients. I love the products that originate from here and I love the customer service. Eric has professionally responded to my emails on a timely manner and has always made sure I am satisfied as a customer. Great product. Used it mainly for thicker hair and that's what it did. Also great for cholesterol and overall health. Been using it for over 6 months straight. Try it and you will love it!!! We are a monthly subscriber's of this amazing product!! Both, my husband and I absolutely love it!!!! Thank you, for always having this awesome product delivered to us on time. It is absolutely the most convenient thing to have it that way!!! We LOVE IT!!! I have ordered from botanical craft many times and never had any issues with products or customer service. In fact I had just moved into a new place and forgot to put the unit number and within 20 mins I recieved an email about an address verification. This stuff is amazing and came to me at the perfect time. When Eric sent me a e-mail about palm fruit and what it could do and what it does I jumped on it right away. I had high cholesterol, 306 to be honest, after 6 months I was at 240 after one year I'm at 218. I've have felt better, my hair doesn't gray as fast and to be honest, haven't seen any in the sink in a very long time!! Great product that I'll be using for years to come! Being a customer of Eric's from a supplement company he use to run I knew I was getting a great product. I get auto ship and it's always on time. Great company!! I became aware of this product and benefits of reduced hair loss and heart protection long ago. I was familiar with one of the owners of this company and products he had created in the past that were known as the highest quality and great customer service. These things together made this an easy desicion for me to buy this product from this company. After 3 months I definitely noticed way less hair loss and that is enough for me to keep using it. The quality seems superior. The owner has a fantastic history for creating amazing supplements that actually work. When studied the price is great, but even then if something has benefits, then how can you put a price on it? I would pay more. I honestly can't say enough good things about this product. I've been using it for about 6 months now, and take it on a daily basis. It's become sort of a "multi vitamin" for me if you will. There's numerous benefits of the product, and anyone who is serious about their health should definitely look into it and give it a try. I also highly recommended the monthly subscription. You can set it to have it auto shipped on whatever day of the month youd like. Works out perfectly that way. You don't have to worry about remembering to order it, you ensure you have it on time for right when the other tub runs out, and not to mention it saves you a bit of money as well!! Overall Id highly reccomendd this product to anyone who cares about their utmost health. Finally a natural product that is truely effective at lowering my blood pressure! I have been using Palm Fruit for just over 6 months now. I have been leading a very health conscious lifestyle for decades. I am very selective about what I will spend my money on. In order to qualify for purchase a product must be able to provide reliable scientific test results for its effectiveness. In order for continued purchase it must demonstrate its effectiveness working within my own body. Palm Fruit has fulfilled both of these requirements. I can speak to the effectiveness with my change in blood pressure over the last 6 months. Prior to Palm Fruit I consistantly averaged 135-140 /65. I now average 120-125 / 60-65. I can not speak to the other claims but as time goes on I will look for additional benefits. Regardless, for me, the lower bp is enough to justify the cost of continued use. Over the years I have tried many natural products to lower my blood pressure to no avail. I have never been diagnosed as suffering from hypertension but my blood pressure has always averaged 134-140 / 65. After 6 months of using Palm Fruit by average bp has reduced to a more acceptable level of 120-125 / 60-65. I started using this product because my younger brother advised he loved it. He stated the product had actually improved his skin and a noticeable boost of energy. I have also observed heightened energy levels and a more vibrant look in my skin. I would definitely advise anyone looking for overall health improvement to use this product. Many thanks to my brother and to you. First off this is a staple in my supplement regimen. Amazing proven health supplement that immediately shows its effects. I definitely feel that this is a quality product. I also have seen some positive benefits in my health in different ways. I do hope to actually try it for a full year though before I can conclude what I really think about it. I'm a pharmacy student and I've been doing allot of research in vitamin e and a supplementation. I found it too much a shame that these supplement all seemed to increase the indecence of cancer. If this supplement ends up having good results, this will definitely change the realm of health. 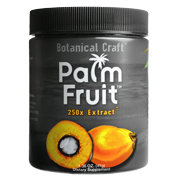 I have been using Botanical Craft's Palm Fruit extract for 6 months now. I started using it because I felt my diet was lacking in vitamin A and vitamin E; furthermore, the vitamin E in most multivitamins do not provide all of the isomers, specifically the tocotrienols which have been shown to exert many benefits. Considering how hard it is to find tocotrienols in most foods, I felt it was a simple choice to start taking this product. I have personally not felt any visible effects from taking the product, but I did not expect that. The internal benefits do not always result in an observable external benefit, but palm fruit does have some physical benefits for skin and hair. I am more interested in the cardiovascular benefits. I do not regard this as a supplement because our bodies do need vitamin A and vitamin E. This is a necessary food to me. I currently take several other supplements, such as curcumin, alpha lipoic acid, b-complex, vitamin D3, garlic pills, magnesium and zinc. Botanical Craft has been very professional, and products always arrive on time. The powder consistency has been great each month with no clumping (seems fresh). I basically scoop some in my mouth and swish some water around to take it since it is a bit hydrophobic due to the lipid coating. I feel this isn't a supplement, but an actual necessary food due to the need for these vitamin A and E isomers and other active constituents. I originally purchased Palm Fruit to see if it would help with the regrowth of my hair. I was thinning and receding faster then I had hoped. I've been on the Palm Fruit auto-ship program now for several months and I am very pleased with the results. I've noticed a lot less shedding and thinning of hair! Goal = achieved! The auto-ship program ensures that I don't run out and makes it super easy to incorporate this supplement into your daily routine. I personally throw a scoop of Palm Fruit into my morning protein drink and I'm done for the day. I am currently on the auto-ship program which makes adding this supplement to your regime super easy. In fact there have been times when I did not complete a container before my next one was shipped. Although this is desirable so you don't run out, I found it east to contact Botanical Craft to adjust the shipping dates and time to better fit my routine. These guys are super easy to work with! This is a great product for overall health and well being. My skin has never looked so great and it has a nice glow to it. The taste of the product is vey good. I just take the whole scoop and put it directly in my mouth. The taste is actually addicting and I look forward to it everyday. Great product! This stuff is amazing!!! I am a long haul truck driver taking palm fruit daily really makes me feel better from sitting in a truck all day. Buy it you will not regret it this stuff has changed my life. Great customer service with respect to response time on inquiries, knowledge of product and other topics and great delivery time.